Content Warning: The entire BioShock franchise is rated M; it contains violence, language, and horror elements. BioShock was the first video game I played all the way through. Yes, the graphics have aged since its release in 2007 (although they're still pretty great), but that does not affect the game's status as a cult favorite. (THE BIOSHOCK COLLECTION WAS JUST RATED BY THE ESRB, AND I AM THRILLED.) I am by no means an expert game reviewer; this is just my totally biased list of reasons you should give it a whirl. 1. The setting is a delight to explore! Welcome to Rapture! The year is 1960, and your airplane has crashed in the middle of the Atlantic Ocean. After you escape the flaming wreckage, you notice a lighthouse ahead. Strange, considering you're in the middle of the Atlantic Ocean. It seems only reasonable that you climb the stairs to seek help. Instead, you find something called a Bathysphere, and it takes you far below the surface. Rapture... A city dreamed up as a de-regulated paradise that fell prey to disaster. You are thrown immediately into a perilous situation with no choice but to do your best to survive. The scenery fits 50's Art Deco style, and you have the option of listening to popular music of the time throughout the game. 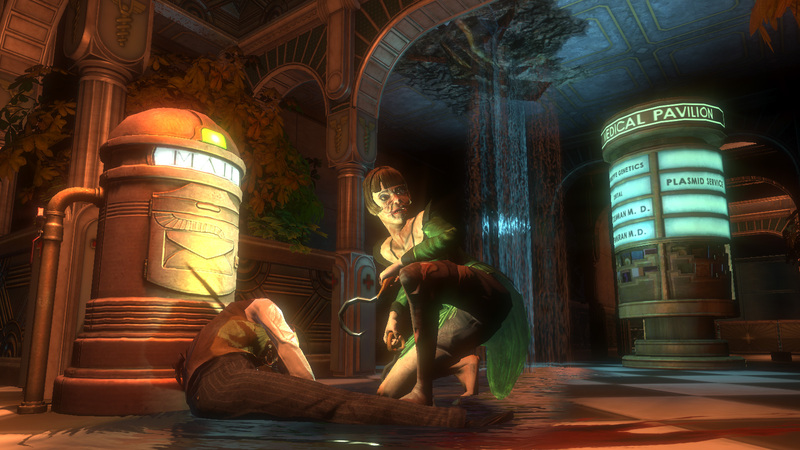 As you explore Rapture, you find recordings that expose the events leading up to its downfall. This, along with interjections over your emergency radio, help to immerse you in the world of the game. I didn't come up for air for quite some time. The main plot leaves your room and time to thoroughly explore this underwater city. You play the game as Jack, a character that you begin the game knowing nothing about. Yet as the game continues, you discover his ties to the city and its inhabitants. Splicers are slave to their impulses. As you work your way through Rapture, you will encounter several nameless characters called Splicers that you'll have to fight to continue. Splicers are people who's genes have mutated due to the use of Plasmids and exposure to ADAM substances that gives one superhuman abilities fueled by a substance called EVE. 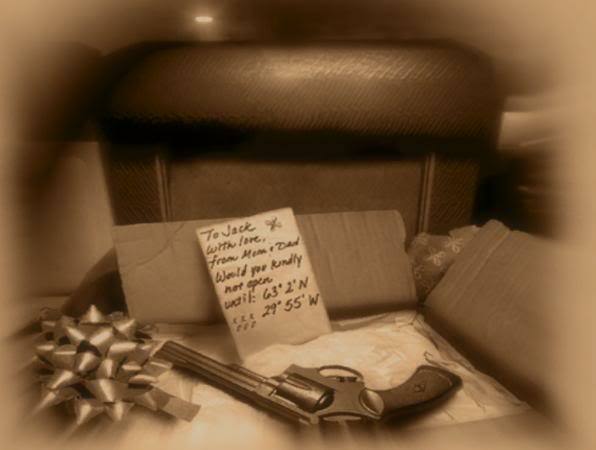 They are murderously insane and serve as a military force for Andrew Ryan, the antagonist of the game. Other antagonists include the game's most recognizable characters: Big Daddies and little sisters. Every Little Sister has a Big Daddy to protect her as she harvests ADAM from corpses. A woman named Brigid Tennenbaum will task you with rescuing the Little Sisters, which leaves you a choice that will effect the outcome of the game. Will you save the Little Sisters in exchange for their loyalty or harvest them for ADAM to fuel your own Plasmid based abilites? A Little Sister and her Big Daddy, one of the most touching and frightening relationships in the game. Pretty much everything in the game has a back story. Even the characters that don't have names are interesting. The ones who work their way into your adventures are even more so. Everything ties together. If you remain spoiler free, the end of the game will leave you open mouthed. Heck, it will even if you get a few spoilers. 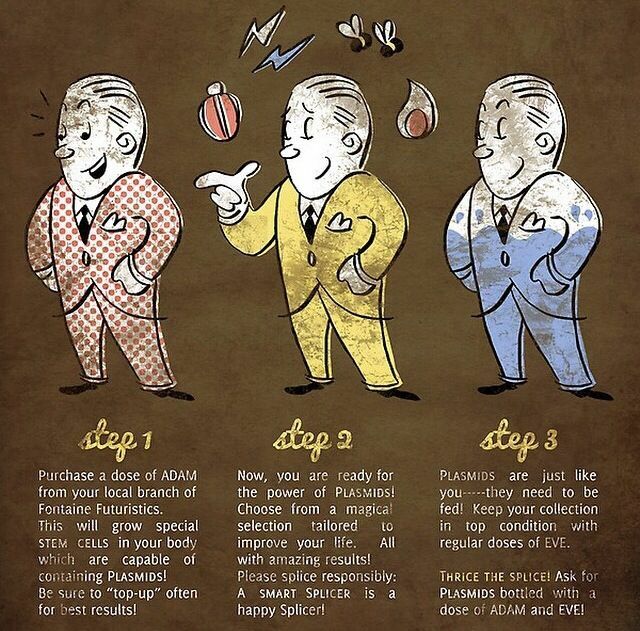 A quick explanation of Plasmids. As I mentioned previously, the use of Plasmids led to some pretty scary stuff that caused Rapture's fall (presumably at least). There's a reason that most of Rapture's population became mutated freaks; the powers Plasmids give you are awesome (and they'll get you out of quite a few sticky situations to boot). Luckily, Jack seems to be immune to Plasmid's adverse effects. Also, it's really fun to send a swarm of bees after an enemy that's really bothering you. Plasmids, along with the improvements that Gene Tonics provide you with, are a considerable advantage over whatever Rapture has in store for you. BioShock spawned not only a ton of cool cosplays but also two sequel games: BioShock 2 and BioShock Infinite. 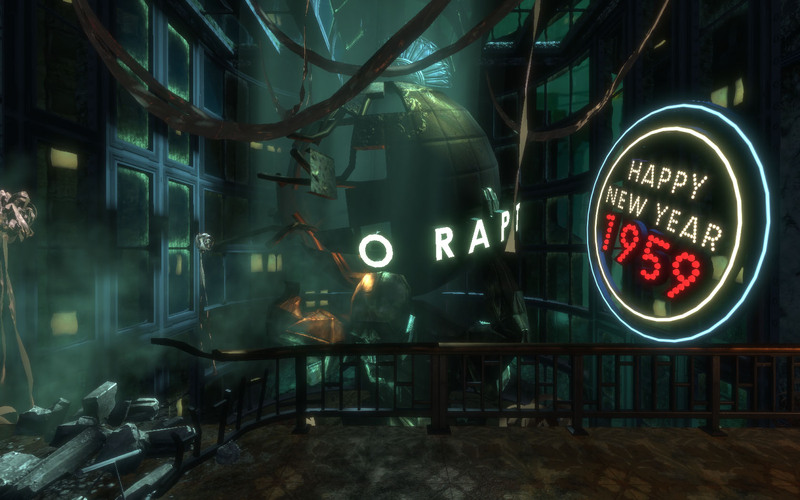 BioShock 2 invites you to return to Rapture and to explore the tale of the original Big Daddy as well as the fate of his Little Sister, now an adult woman. BioShock Infinite instead focuses on a city in the sky called Columbia. Similar to the first game, you play as an individual with a limited awareness of their own deep roots connected to the seemingly foreign city they've suddenly been dropped into. By the end of Infinite and its DLC Burial at Sea, the ties between the three games are clear and satisfying. Now, would you kindly just play the game already? If you're not convinced, here's a parody of Under the Sea that explains a bit more about the game. Have you ever played any of the BioShock games? If so, which is your favorite? 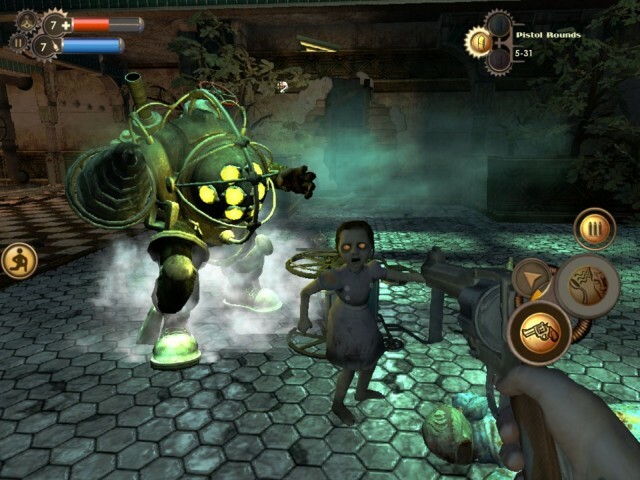 What other games would you reccommend to fans of BioShock?